Amazon carries the beauty of her mother and the attitude of her father! Amazon's success in the show ring is nothing less than spectacular, going undefeated in the classes from Bred By Exhibitor. She beat her mother's amazing show record by one show, finishing in just 2 weekends with a total of 5 shows, all at 6 months of age! She shows great skill and drive on the lure coursing field, but she is sharp and tends to cheat to save time and energy! Starting selective specializing summer 2010. 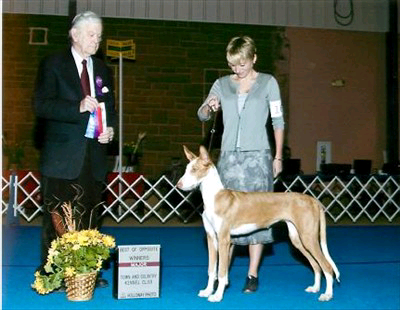 Finished championship in just five days from the Bred By class at 6 months of age!